To my dismay (and my mom’s delight), my trip got cut a bit short. An obligatory networking conference in Los Angles for school is taking the place of Ecuador and Colombia. 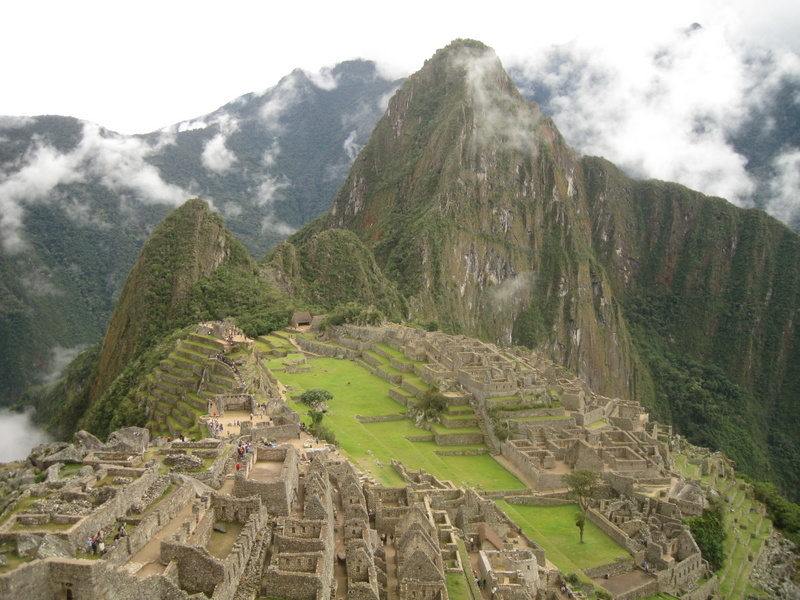 So anyway, Peru was my last real stop on Around-the-World Part II. And now Los Angeles is my final stopover before heading to Michigan for two weeks and then moving to my new home in South Bend! On day two, after waking up at 4:30am, I made it out of Aguas Calientes on the first set of buses up the 12 kilometers of winding road to Machu Picchu. Inopportunely, it started to rain about the same minute I disembarked from the bus. Luckily, this weather cleared out after about an hour. Unluckily, the oftentimes dense fog took much longer to finally dissipate. But it all worked out ok for my hike up Waynapichu. This is the mountain behind the civilization in all of the famous pictures. It is possible to hike it, though an additional ticket at a specified time is required. I had heard some horror stories about six inch wide wooden bridges without handrails crossing ravines (with the potential for fire-breathing dragons chasing you down…) that you have to traverse in order to complete the climb. Auspiciously, this wasn’t actually the case. Parts of the climb involved relatively steep steps but that was about the extent of the scariness factor. All of the walking I’ve been doing has paid off because somehow my legs weren’t even sore after the two and a half hour journey. Clearly you were just climbing too fast… I’m pretty sure I crossed that bridge with the dragons right on my heels! And we’ll have to agree to disagree on the scariness factor. But I think you might have felt differently if we had been able to do the cave part. I found some video of that part trying to show people what we did & I can assure you I would rather have faced those dragons than joined you had you done it. Good for you. Good luck in your journey. Have you tried visiting the Philippines? Please have it in your list.